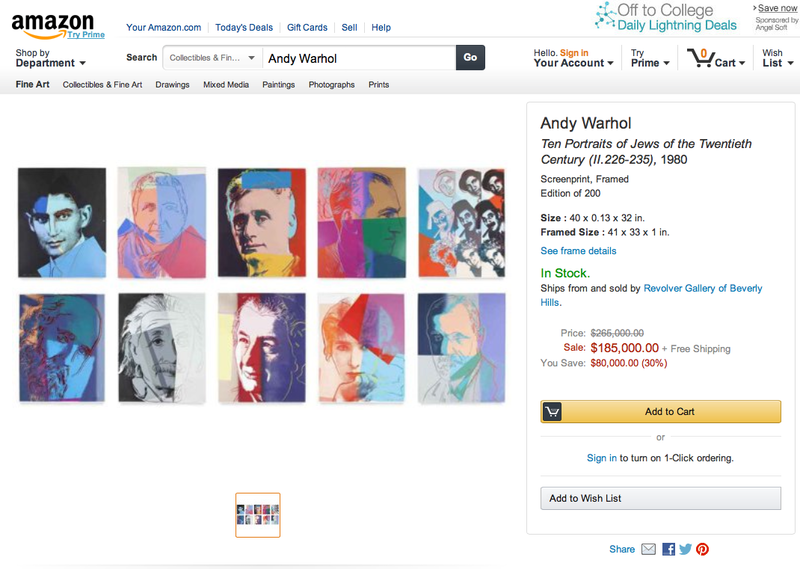 In our opinion, the new Amazon.com art section is shockingly sloppy, dated, lacks professionalism and unless the A-To-Z Guarantee is revised, financially risky for art with a price-tag of more than $2,500, especially if you learn the art you purchased is different than you thought and report the problem more than 30 days after shipment. In addition, there are numerous instances of grossly overpriced art, in some cases, 10+ times the last public price at auction! 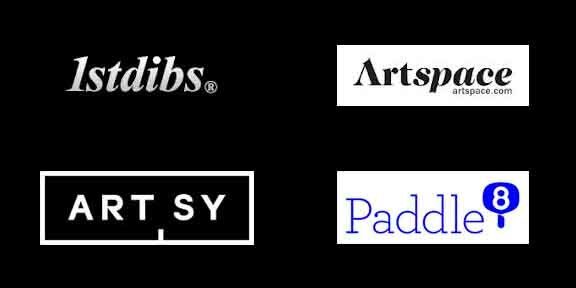 We think the new Amazon art site lacks pizazz and feels dated vs. online art ventures from artspace, artsy, paddle8, 1stdibs and the always innovative Christie's and Sotheby's. 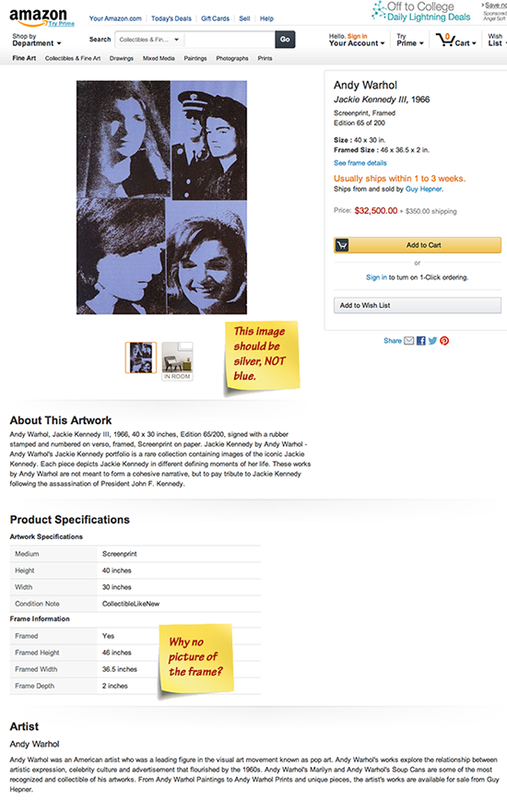 We have been carefully looking at the new site for the past two weeks to see how Amazon offers Art by Andy Warhol, Richard Pettibone, Claude Monet, Norman Rockwell, Roy Lichtenstein, Jasper Johns, etc., and frankly, are less than impressed. The new Amazon/art site was launched with little thought to providing a safe infrastructure for online art purchases. 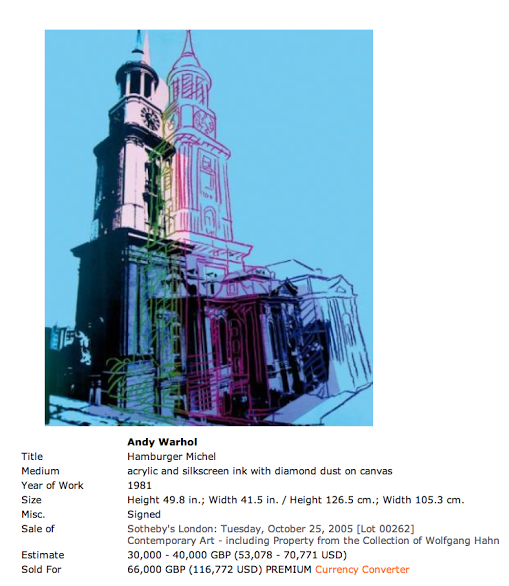 Frankly, the less than professional website Amazon introduced is even more surprising since Amazon has had previous online art experience as a 2000 partner with sothebys.com in Sotheby's unsuccessful launch of online art auctions. Although Sotheby's lost nearly $100 million in its launch of online auctions, there was a fundamental difference in quality between Amazon and sothebys.com. When Sothebys.com launched, consumers never had to question any lot's authenticity as Sotheby's eliminated the possibility of any and all consumer risk concerning counterfeits and/or Works not being as described. Sothebys.com boldly eliminated any and all risk of buying online because "Every lot that Sothebys.com offered in 2000 was guaranteed for authenticity and condition by acknowledged experts—whether by Sotheby’s or one of the 5,000 dealers from around the world" whom Sotheby’s had pre-selected, including Joseph K. Levene Fine Art, Ltd., an original Sotheby's Charter Member for its online art auctions. Accordingly, the Sothebys.com selling proposition joined then with Amazon as a partner, ensured that all lots offered online had the same five year Terms of Guarantee found at the bricks and mortar Sotheby's; for reference, Christie's provides a similar Terms of Guarantee. Amazon has an obligation to protect online art buyers with an appropriate Terms of Guarantee that covers the total online amazon/art purchase, not just the first $2,500. Did someone in Amazon Legal Department forget that the $4.850 million Norman Rockwell is not be covered with its current A-To-Z Guarantee? The insufficient consumer protection guarantee offered by amazon is a reminder of the insufficient $250 Buyer Protection maximum offered by eBay until 2010. In fact, the inappropriate $250 eBay Buyer Protection maximum encouraged Joseph K. Levene Fine Art, Ltd. to provide all Clients with a guarantee of Authenticity for all Fine Art offered and sold on eBay at all price points when the Joseph K Levene Fine Art Ltd eBay Store was launched in 1999. Essentially, Joseph K. Levene Fine Art, Ltd. decided that its online Terms of Guarantee for its eBay Store should match the art vendor requirements as specified by the Uniform Commercial Code. Why Have Auction Houses Sold A Counterfeit Calder Sculpture Over 75 Times Since 2004? "All of the images we're using for the artwork are high definition. They're all able to be looked at in more detail." 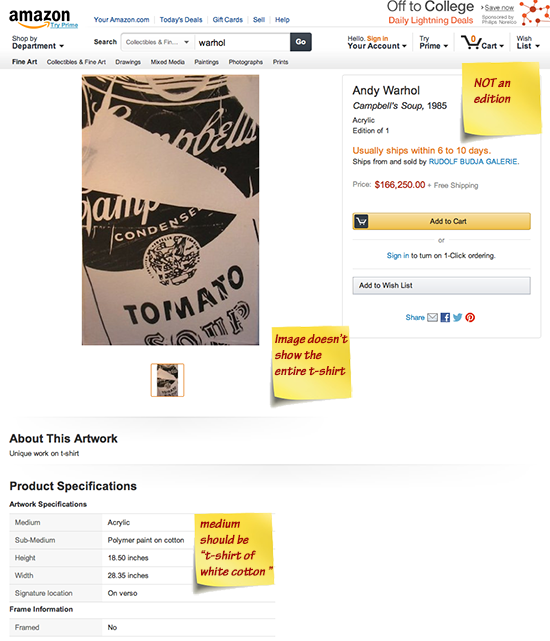 We have noticed numerous images on amazon that are reproductions from Books and/or Catalogue Raisonnes, including art with six figures prices like the Andy Warhol Suite of 10 Jew Screenprints for $185,000. that are sold framed, yet there are no frames shown. Look closely and see moire patterns from scanned images from Andy Warhol Prints: A Catalogue Raisonne: 1962-1987, Fourth Edition, D.A.P., New York, 2003. 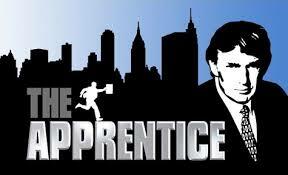 The new art site from amazon is so sloppy and poorly designed, that if it weren't live, you might think it was created by the losing team from Donald Trump's The Apprentice. Is Amazon.com vetting the art for sale 24/7? The Amazon.com/art site has been designed with little thought to provide sufficient details to ensure that online art buyers aren't confused and/or surprised should they pull the trigger and make an online art purchase. Does anyone at Amazon/art actually understand the requirements of selling fine art online, especially if the art is priced beyond a few dollars? The new site appears to be managed by someone with little insight about selling fine art, especially the concerns of online art buyers who don't want surprises since they don't see the art they purchase before making payment. It is essential someone at amazon be given the responsibility to ensure all online art for sale is both authentic and not vastly overpriced. Furthermore it behooves amazon to implement a procedure to ensure listings include accurate condition assessments; correct documentation details; inclusion of photographs of the actual art for sale and appropriate provenance. Listings that don't meet this criteria should be removed. For reference, we have made numerous attempts to communicate errors we have noticed to amazon and have yet to receive a response, even though many errors cited in this Article in The Art Fine Blog have been previously reported. authenticity questions are numerous, especially with the sloppy documentation? excessively overpriced art for sale that no reasonable art dealer would ever recommend. The amazon art site was launched with an insufficient refund policy. Let's say you buy a Picasso Etching for $150,000., and find out it is not authentic after you have owned it for two months? Is the entire $150,000 covered? If it is fake, amazon guarantees you will get $2,500 refund if you speak up within 30 days of shipment, but probably nothing after 60 days. Amazon A-to-Z Guarantee Only Covers Purchases Up To $2,500 Within 30 days of shipment! Well, the A-to-Z Guarantee is great for most book purchases, or that computer you give your son for graduation, but now that Amazon is selling art priced in the millions, the Amazon A-to-Z guarantee leaves you a few zeros short, especially if you find out the Work that you thought was authentic cost more than $2,501. The sad truth is that unless you find out within 30 days of shipment, and you purchased your art via Amazon and not directly from the dealer offering the art, you might just be left holding the bag. Put another way, you might get screwed if the art you purchased turns out not to be authentic/different than what you thought it was, especially if it cost say, $150,000., as our example indicated. At best, you might get lucky and only lose $147,500 if the art is fake and that assumes you report the problem/issue within 30 days from the date the art was shipped to you. Contact Seller for Refund Policy. For some reason, even though all Amazon art purchases are handled by Amazon, the site has not enforced art vendors provide their respective refund policy. In fact, Amazon recommends you contact the respective art Seller, even though it doesn't mind accepting your American Express to cover payment for a Work of Art priced in the millions! What happens if you have nothing in writing if you contact that dealer directly? We wouldn't dare risk buying anything with such an insufficient refund policy. Norman Rockwell Painting for $4,850 million is the Highest Price Art For Sale! The highest priced Work of Art currently being offered on Amazon.com/art is a Norman Rockwell painting titled Willie Gillis, Package from Home, offered by M.S. Rau Antiques at $4,850 million. Not disclosed is that the same Norman Rockwell Painting was sold December 1, 2012 at Susanin's Auction for $2.8 million, or was it really sold? Why is there no mention that the Norman Rockwell painting was offered at Susanin's Auction in 2012 in the listings documentation details? Isn't the potential buyer of this Norman Rockwell entitled to know its history? 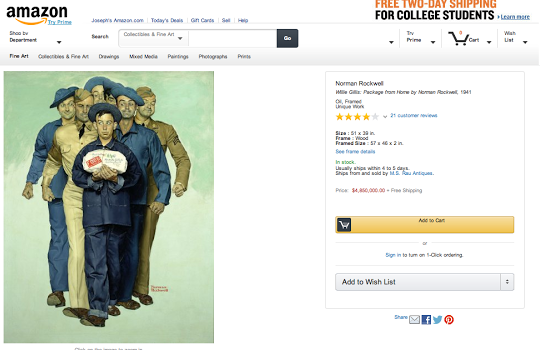 Why does Amazon condone not listing the actual history of the Norman Rockwell Painting, including provenance ownership? After all, there was plenty of press indicating the Norman Rockwell Painting would sell for as much as $10 million when offered by Susanin's Auction in December 2012. Non-disclosure of key information is inexcusable and, most likely, in violation of the Uniform Commercial Code. 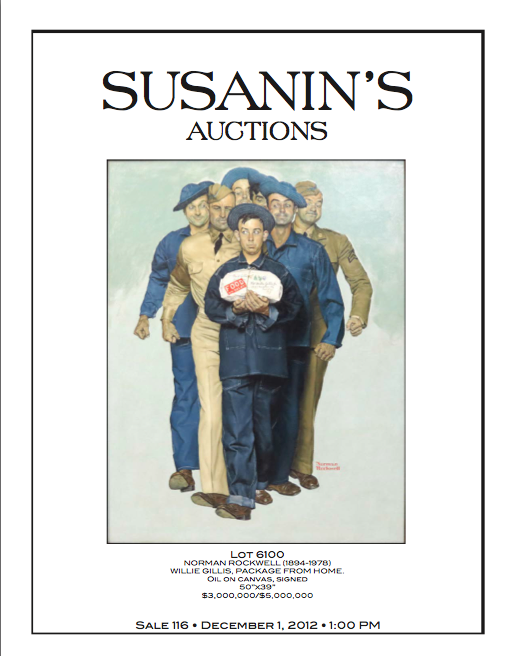 Did Susanin's sell the same Norman Rockwell Painting for $2.8 million in December 2012? Jackie III Screenprint is the wrong color and where is the photo showing frame? 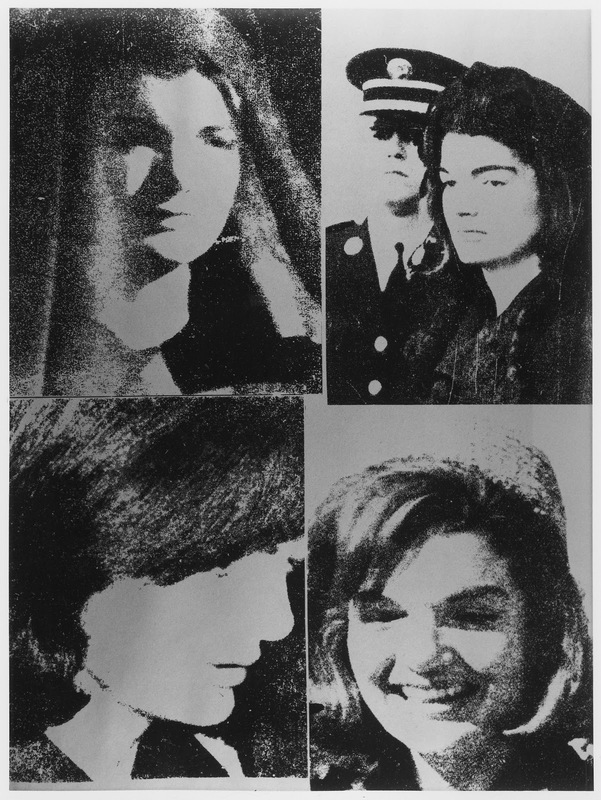 Andy Warhol Jackie III Screenprint is the wrong color & where is photo showing it framed? 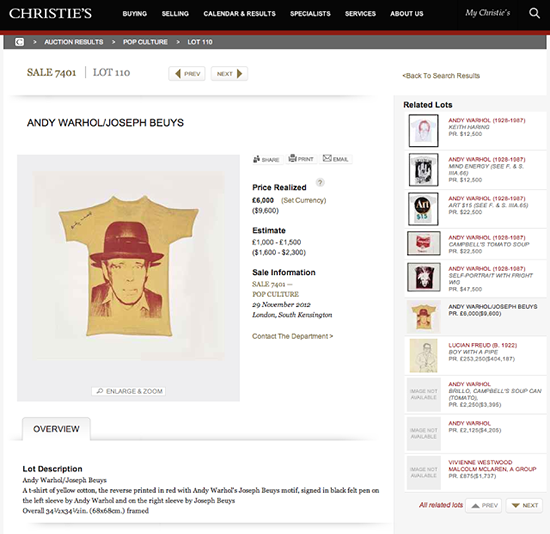 $166,250 Warhol t-shirt overpriced as similar t-shirt sold at Christie's for only $9,600! The Roy Lichtenstein Print, Imperfect 220 mixed media Print was published by Gemini G.E.L. in an edition of 45 numbered impressions with 14 AP's. The correct medium description is woodcut and screenprint in colors with collage on Archivart 4-ply Museum Board. 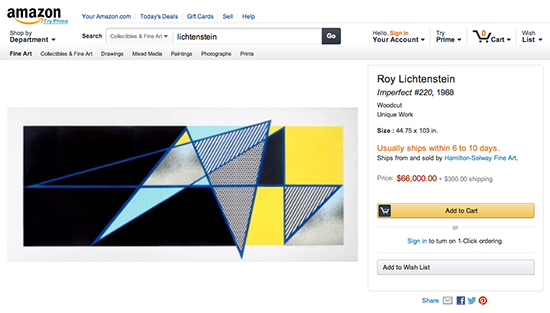 Accordingly the documentation ascribed on Amazon is incorrect as this Roy Lichtenstein mixed media work of art is NOT unique and not just a woodcut. 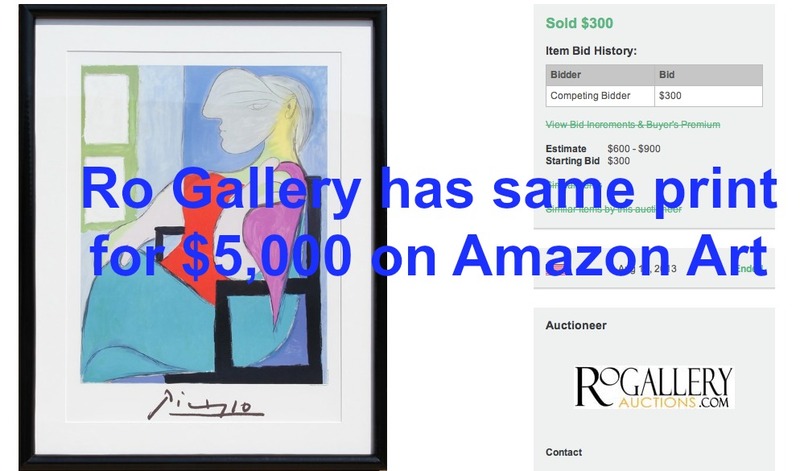 Ro Gallery sold the same After Picasso for only $300 vs $5,000 Amazon price from the same seller! Ro Gallery has same After Picasso on Amazon for +$4,700 more! In either case, this posthumous Picasso is hardly investment grade material. Created after Picasso died in 1973, the correct documenation is "After Picasso", not "Pablo Picasso". On Amazon, the listing states the work was created in 1932 which is also inaccurate; the original painting yes, this print signed by Marina Picasso, Pablo Picasso's granddaughter, no. 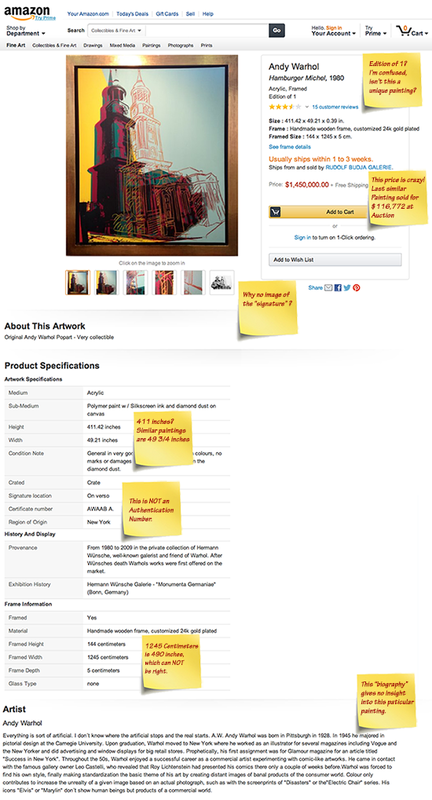 On Amazon, Ro Gallery states it is from the edition of 500; on Live Auctioneers it is an edition of 1000. Either way, a bad investment and not recommended. 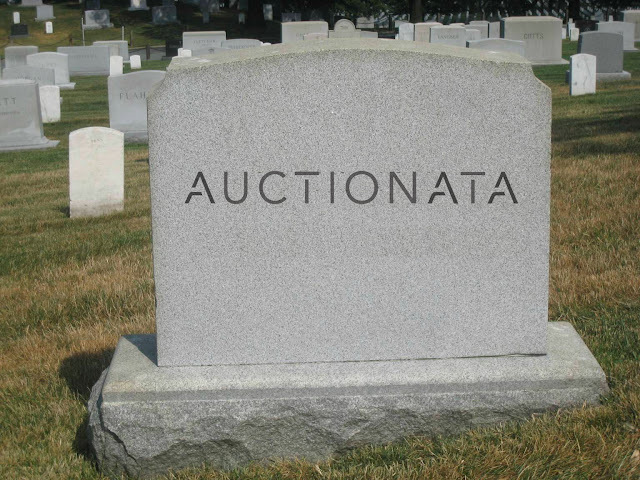 Will never be collectable nor desirable and check out how the price keeps going down on Live Auctioneers from same seller. Post by Joseph K. Levene Fine Art, Ltd.
from Joseph K. Levene Fine Art, Ltd. Follow Joseph K. Levene Fine Art, Ltd.'s board Joseph K Levene Fine Art Ltd eBay Store on Pinterest.